Damaged home photograph submitted by blogTO Flickr pooler fisso416. Who wants to lend me $1.5billion? I was thinking of how cool it would be to own the Fairmount Royal York Hotel, which is up for sale. When we have too many green-poopers (aka Canadian geese) in the city, rounding them up while they're moulting (and unable to fly) and taking them away is one way to alleviate the problem. Who would have thought that toothpaste would be something worth counterfeiting? Beware of fake toothpaste labelled "Coigate" - the chemical contents could make you ill. So far they've been spotted in Guelph and Halifax. The owner of Steelback brewery is facing allegations of sexual assault, and is calling the allegations a "total lie". His macho appearance in the sexual innuendo-laden "ooooh, that IS big" TV ad may be risque, but assaulting a woman is "not in [his] character". Yesterday's violent storm caused quite a bit of damage, especially to a home in the Danforth and Coxwell area. Check out the video, which highlights some of the incidents. Police are running a pilot project with Smart cars in the role of parking authority cruisers. It's about time! They may have to put the smaller officers on parking duty though. 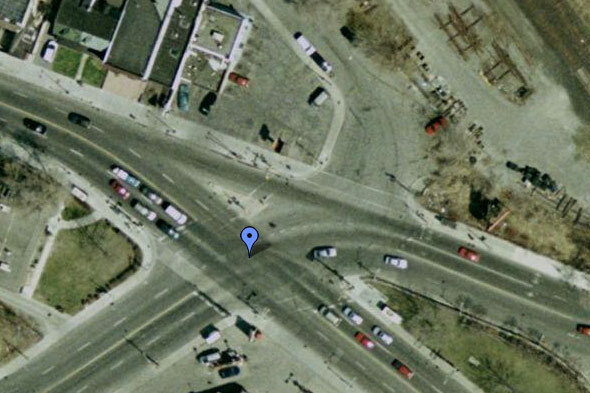 Yesterday's answer: Eglinton and Mt. Pleasant.